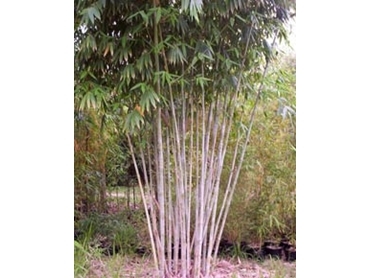 Bamboos Wholesale makes available the Ghost Bamboo (scientific name Dendrocalumus Minor ‘Amoenus’), an ornamental bamboo featuring powdery white culms fading to lime green striated culms as they mature. As the bamboo grows, new shoots emerge with black bristles creating an aesthetically pleasing effect with the contrasting white, green and black culms. This bamboo can reach heights of 8-10 metres with a culm diameter of up to 50mm. It has proven to be durable in almost all conditions from cold and frosty to hot and dry areas. Ghost Bamboo is strong and straight making it an extremely workable timber.